Byron Rice is busy these days. And if you're a musician, busy is exactly what you want to be. Byron describes himself as a west coast kid, growing up between parents living in both Washington and California. He said, "I was kind of a dork during high school. Kind of a Steve Erkle, my nickname was actually 'Screech.'" He left the west coast for college in Illinois and was married. Byron and his wife had two daughters who are now 18 and 16-years-old. The family was living in Nashville at the time. "I was married for 10-years and I realized I was gay. My wife and I divorced. I was in the beginning stage of being newly single when I became infected with HIV. I trusted someone and it was a mistake." He said. "I was organizing and encouraging others in the community to get tested and a friend of mine suggested that I get tested. My friend called me shortly after that and told me he needed to see me in his office. I said, 'OK, do you want to do lunch?' And he said, 'let's talk first and then we'll see.' When I got to his office he told me I'd tested Positive." Byron has been HIV-positive for 10-years now and when he was diagnosed back then, that's how long he was told he had to live. He says, "After I was diagnosed, I wanted to see where I fit in the world. I had been living a life of being under an umbrella of secrecy and I didn't want to live that way anymore. Just one incident had changed my life dramatically." At the time he was a Christian musician and they weren't very accepting of his status, so he switched from Christian to Folk music. "It took me about 5-years to find my voice. I produced an album about 5-years ago called 'Lost In The Woods' and shopped it around to some labels. It was picked up by 50/50 Global Muzik." He said. "My label has been very supportive and let me get my voice out. My new release album on EDM is 'Somebody Show Me Love' along with a new single, 'Sink In.' With 'Sink In,' I was waiting for the right time to release it and decided the time is now. It encourages people to love and not hate. I'm not necessarily talking about the political climate and war but on all levels. I've been a victim of internet bullying when I was still in Christian music and people were telling me I wasn't a man of God anymore. It took me 5-years to get over that." Byron's new album and single have been released December 1st and the radio mix and music video will be released January 1st. He describes his music as "Folk Fusion." His advice for someone who is newly diagnosed is very similar to others we've interviewed. He says, "Find a good core group of friends that you can go to on good days and bad days, that won't judge. Make sure that you can openly communicate with them so things don't turn into an argument." He credits the Comprehensive Care Center of Nashville and also Nashville Cares with helping him along the way. He said of both organizations, "They helped me come out of the dark and I wouldn't be here if not for them." When Byron's not recording or playing live at any number of Nashville venues, he volunteers his time to organizations like Susan G. Komen and is looking forward to participating in Toys For Tots and a lot of Pride events this coming year. 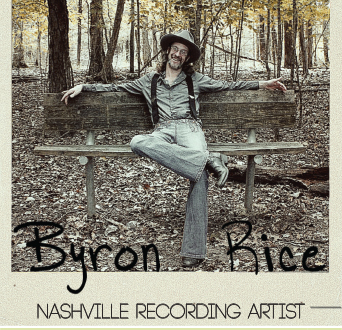 For more information on Byron Rice, his music and his upcoming Nashville appearances, you can visit his Facebook page at: www.facebook.com/ByronRice.theMAN and go to his record label's website at: www.5050globalmuzik.com/.